Columbia University announced last week that its endowment investments returned 9 percent during fiscal year 2018, making it the only school in the Ivy League to trail Harvard in endowment returns. The Columbia Investment Management Company, which manages the New York school’s finances, announced that the gains brought its total endowment to $10.9 billion. This October marks the first full fiscal year group chief Peter Holland’s has overseen its returns. The school’s endowment returns trail this year’s Ivy League average of 11.8 percent as well as the S&P 500, which returned 14.37 percent in the fiscal year ending June 30, 2018. Harvard returned 10 percent, an improvement from last year’s return of 8.1 percent, but still behind most of its peers. In a press release, Columbia University President Lee C. Bollinger noted the returns’ impact over the last decade, but he did not directly address the school’s latest fiscal year returns. Columbia’s statement noted part of the endowment’s growth came in part thanks to a “substantial growth in gifts,” including donations from Herbert and Florence Irving, as well as Roy Vagelo. The school’s endowment is made up of over 5000 separate funds. N.P. Narvekar, CEO of the Harvard Management Company, previously oversaw Columbia’s endowment. 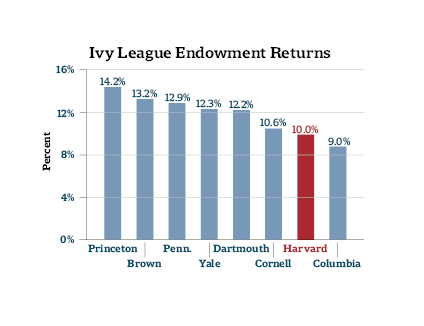 During the last reporting cycle, a period in which Narvekar led Columbia’s endowment for the first part of the fiscal year, Columbia returned 13.7 percent, the third best returns in the Ivy League. Experts said it is too early to judge Narvekar's strategy at Harvard, instead recommending that Harvard’s investment performance should be judged as Narvekar’s tenure progresses.